Let me be candid for a moment—you should not take your headshot yourself. Even professional photographers, unless it’s part of some art project, usually get a colleague to make their headshot. The purpose of a headshot is to help you make connections you need, help you get noticed, help you stand out, or help people to begin developing a sense of trust before they even meet you face to face. When you take a ‘headshot’ yourself, it’s usually a ‘selfie’ which often comes with all kinds of social connotations of its own—Many that you’d maybe really rather not put out there on LinkedIn. But, maybe it’s time, maybe it’s money, maybe it’s just that you need to get something done and you just can’t wait another day. 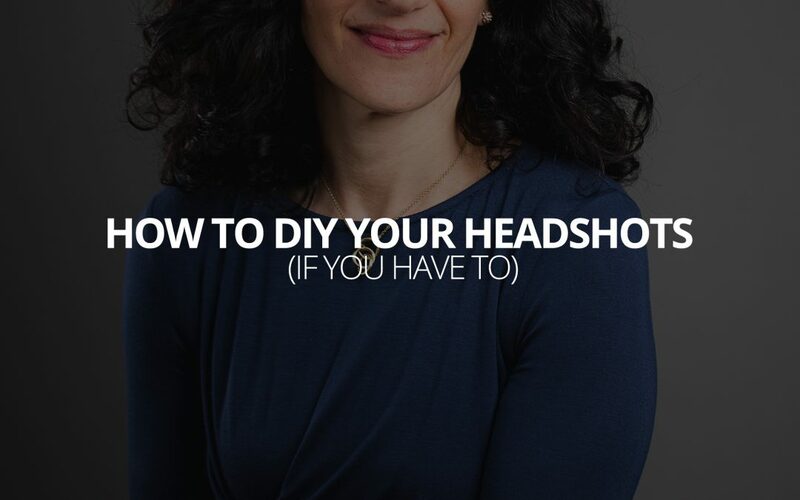 In other words, perhaps sometimes taking your own headshot is the only way to move foreword, and in that case, do it as best you possibly can. You might even fool some people. The advice served up in this article will be much easier if you go to Amazon and buy one of these, and one of these. The first is a ‘remote trigger’. It’s a cheap little device that lets you press a button to take a picture from a distance. The second one is a flexible little tripod you can use to mount your phone almost anywhere. If you can’t or don’t get your hands on these items, you can work around them by using the camera timer built into your smartphone to take the picture, and you can stack books on tables and chairs to prop the phone up. But, be warned, the position of the camera is extremely important to a good headshot, and the difference of just an inch or two can make or break a photo. If you can’t wait and you need to get this done today, those items I listed above are typically available in local stores, such as Best Buy or Target. Totaling just around $30, it’s definitely going to be worth it if you can’t pay someone to do this for you. Without light, there is no photo. So, first make sure it’s daytime and the sun is shining outside. Don’t be tempted to use artificial light sources, such as desk or table lamps. You want high quality, natural light. Next, you need to find a spot where the light is soft. That means the light is not falling on you directly from the sun, but instead is bouncing off other surfaces or getting scattered by clouds, before it gets to you. The shade of a large building can be a good example, and a cloudy day also works great. Next, the light you’re looking for should be coming primarily from one direction—the side—and the areas visible behind you should also be shaded. Under the overhang of a porch patio, or a large open window are good examples. In this case, a big tree is a bad example because although there would be plenty of shade falling on you, the background behind you will still be very bright. There should be less light falling on you than whatever is in the background. So, in 90% of cases, your best bet is to just look for a big window. When you position the camera, you’ll want to place it vertically within about 5 inches of your eye line, and it should be pointing so that whatever is behind you is getting hit with about as much, or ideally a little less, light than is hitting you. If you place the camera a little below your eye line, you’ll project a little more confidence. And likewise, if you position the camera a little above your eye line, you’ll project a more approachable look. Of course, when it comes to taking a good portrait of yourself—let alone a headshot—the position of the light and the position of the camera will play with each other and you may find yourself having to adjust the camera’s position once you start positioning yourself, so don’t get discouraged. At this point, the height of the camera, and the background are the most important things to look for. Avoid putting ugly things in the background, avoid overly busy or complicated backgrounds. Clean up the office (or at least shove things to the other side of the room), if you have to! Finally, it’s time to position yourself. First, stand so that the image captures you from about waste up (don’t worry, you can crop it in later), and leaves about one head worth of space above the top of your head. Don’t put your head right in the middle of the frame. Once your standing in front of the camera, look around to see whether there’s anything distracting in the background. Are there sticks or poles coming out of your head? Is there a mess in the background? Take care of those things, or adjust the position of the camera until it looks good. Next, point your toes away from the light source by about 90 degrees. So, if a big window is the light source, point your toes so the window is firmly on your right or left. Now, rotate your upper body until it’s just about pointing toward the light source. At this point, you’ll likely be positioned a little awkwardly. So you need to relax into it. Cross one foot over the other, or fidget with your feet a little until it feels a little more natural. Finally, here comes the fun part. It’s time to be your own photographer. With the light in the right place, the camera positioned well and your posture setting you up for an easy high quality look, the last step is to fine tune your position and capture your pictures. Using the little remote trigger I linked to earlier (or the timer built into your phone), point your chin slightly toward the light, take a deep breath, push out a chuckle, and take the photo. Then, adjust the position of your chin up or down, left or right a little bit, take a deep breath, push out a chuckle, and take another photo. Do this repeatedly. Then, change things up. Try placing your hands together, or folding your arms. Place hands in pockets, or on your neck, or fidget with your hair or neckline, while taking a photo. If you’re feeling ambitious, try inverting your position by pointing your toes away from the light in the other direction, and doing the whole thing again. After 15 or 20 minutes of taking pictures of yourself, you’ll probably have a few keepers in there, you’ll just need to find them and decide what to do with them. Start by flipping through the photos you took, and pick just 3 or 4 that you like. If you have a modern smartphone, you may be able to use lighting or background blur effects. Try a few of these affects out and see how you like the results. Remember, for a headshot, subtlety is key. So, don’t use any bunny ears or digital sparkles. Just pay attention to effects that help to emphasize you against the background. Apple’s iPhone has a suite of impressive effects that can subtly mimic various lighting conditions without drawing much attention to themselves. So, if you’re an iPhone user, you’ll want to experiment with those. Once you’ve selected a photo, pick a filter to apply to it. Avoid the ‘vintage’ looking filters, and instead focus on filters that help the image ‘pop’ by making the shadows deeper, or the colors richer. But again, subtlety is key! You don’t want anyone to look at the photo and wonder what filter you used—you just want them to say, ‘oh that’s a nice photo’. This part can be a little daunting for people. So, enlist the help of friends if you need to. Share those 3 or 4 images with people who care about you and solicit their feedback. When you’re done, you may just have a headshot good enough to keep. Of course, this is what we do all the time, and we make the process easy and painless—you don’t even have to leave your home or office. So, if reading this felt a little overwhelming for you, don’t hesitate to give us a call. We’d love to create some beautiful and unique headshots for whatever purpose. Check out the For Professionals page here on our website for more information!